Gringo Records - CLAMBAKE - "Gator In The Pool"
Clambake comprise of brothers Andy Barker on 4string guitar and vocals and Nick Barker on leopard print drums and vocals. Lets cut to the chase, Clambake rock (and roll). Primal punk rock meets rockabilly, country and blues – the new rock and roll is rock and roll, so don’t let anyone tell you different. The four stringer and stripped down drumkit compete with the urgent delivery of the two protagonists – brothers since 1972, comrades in arms since 1995. The ‘Bake got more serious in 1999 after dates with R L Burnside and Gallon Drunk, resulting in a single release on Dig the Fuzz Records. 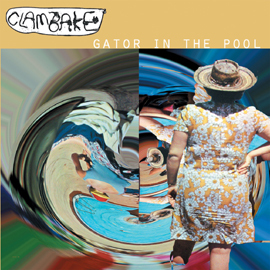 Now Clambake have made a firm commitment to make the world a better place with their debut album on Gringo. This release nails the lo-fat Clambake approach to their work. Recorded by Mark Simms and Neil Johnson on to an ancient Revox two track machine in a single afternoon, the songs on ‘Gator for the Pool’ get to the point and leave. Life is too short for arsing about when there are things to be done, nights out to be had, children to be raised and money to be earned. This stuff is laconic in the true sense of the word, pausing only to drag the lake and fill its pockets with trash and plastic. Clambake have honed their live delivery to 20 minutes and will be coming to your gotham soon. They’ve already trodden boards with the likes of The Jon Spencer Blues Explosion, The Fall, The Bellrays, The Mooney Suzuki, Beachbuggy, The Grips, The X-Rays and Mr Airplane Man. Recorded in a room in Nottingham by The Electric Press live on to Revox two track.